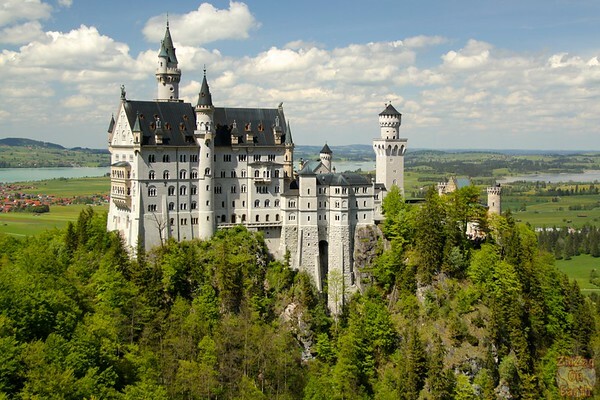 Planning on visiting Bavaria and its treasure Neuschwanstein Castle Germany? Below are 7 of the best spots I found to photograph the castle: the classic ones and some more originals. 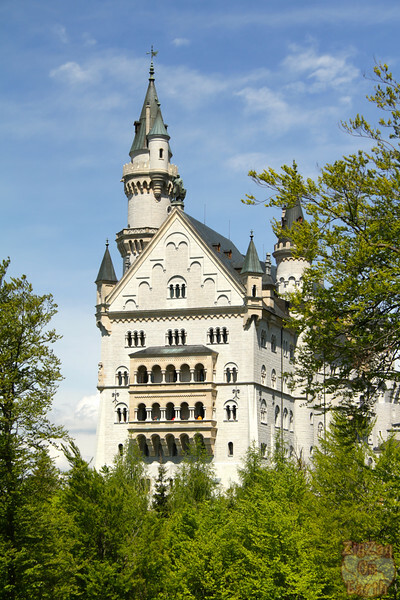 Discover them with Neuschwanstein Castle pictures. 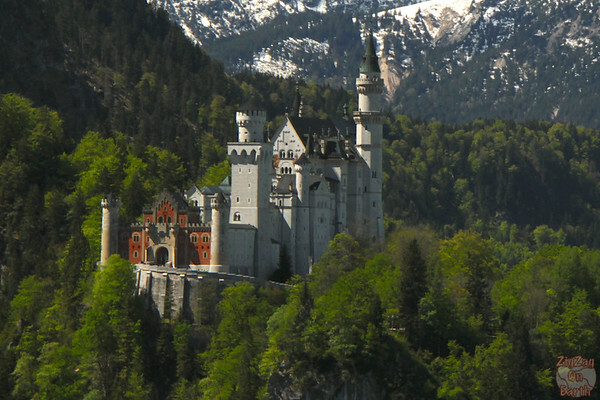 This post is a collection of locations to photograph the fairy-tale castle of Neuschwanstein in Germany. 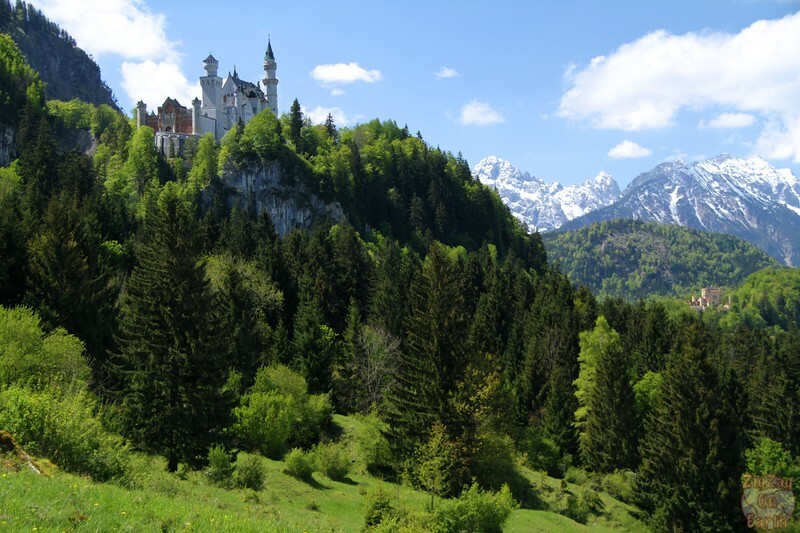 The location is absolutely stunning and it is hard to understand why this one castle is not on the list of Unesco sites in Bavaria. 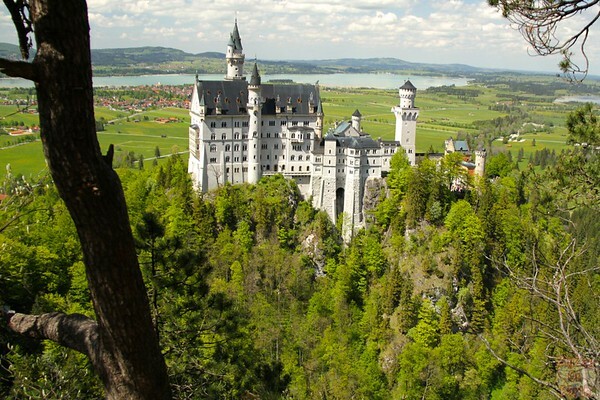 It makes for a great day trip from the city of Munich. If you are like me, you want options and not want just the typical shot from the bridge (Marienbrücke). So this list is for you. Photos were taken mostly between 10AM and 3PM - better lighting early or late would improve detail rendering. Even in the rain, Neuschwanstein ﻿looks nice. I have listed for you the best photographic locations I have found so far. 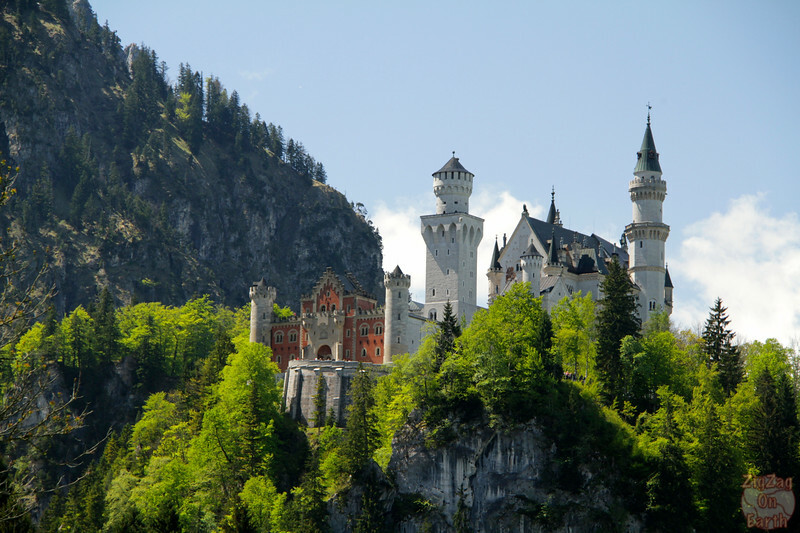 I hope this will help you plan your time around Neuschwanstein and come back with gorgeous pictures. But first lets find out how to travel to Neuswchanstein Castle Germany. From Füssen: bus 78 (right outside of the train station) and stop either at the bottom of the hill where the castle stands or at the Tegelbergbahn. 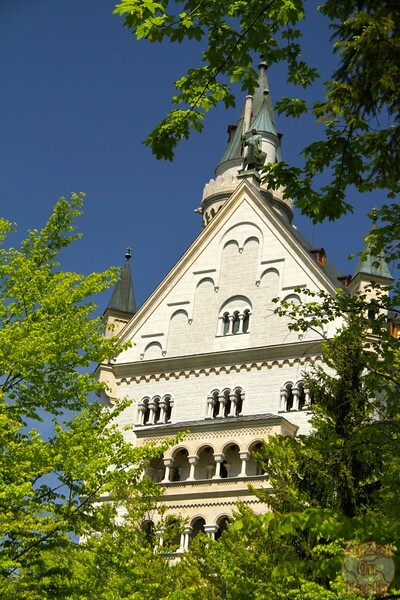 The region is a great place to stay overnight with the lake, mountains and castles. 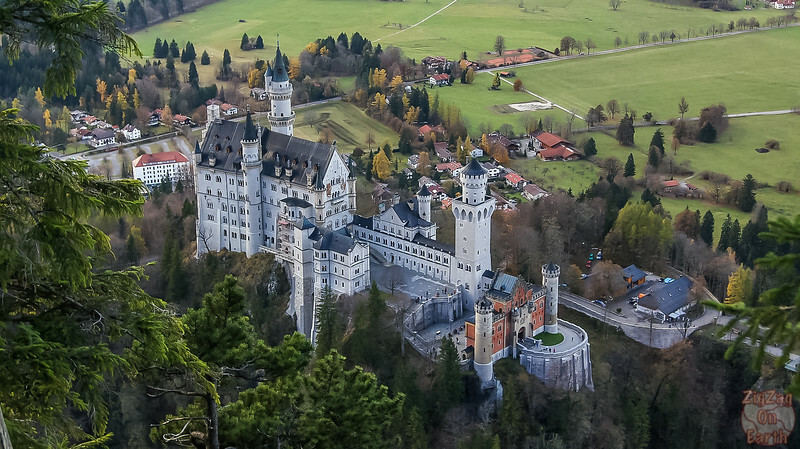 During my research I found out that many of the dreamy pictures of this fairytale castle are taken from the sky (hot air balloon or helicopter). 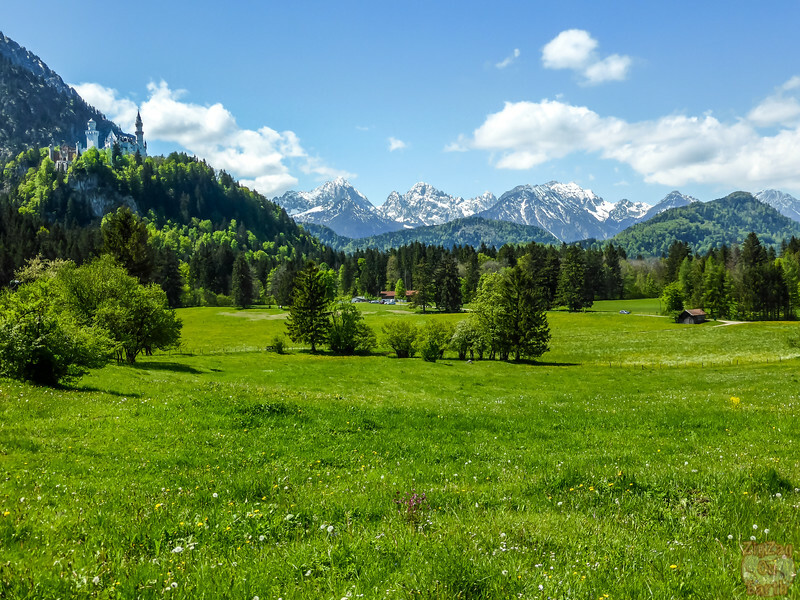 You can for example take a 90 minute helicopter ride from Munich that will go over the castles and offer you amazing views of the moutainuous area. If you look on google map you will see that, just 2 km away, there is a cable car called Tegelbergbahn (hours and details on the cable car website). 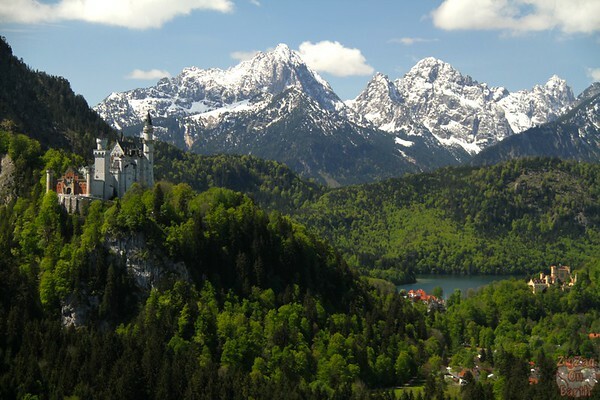 You cannot see the castle from the top but during the ride you get incredible views of both Neuschwanstein and Hohenschwangau castles with the mountains behind. Note: I have been told by locals that from the top of Tegelbergbahn, there is a hike going downwith some good views of the castle. It was all in the snow when I was there so I could not try but I thought I should share. 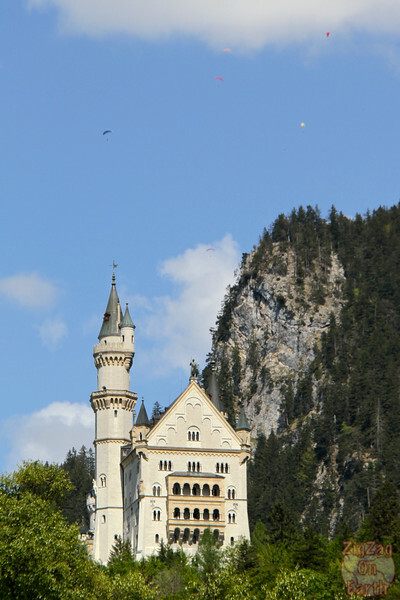 For photos of the rest of the view from the Tegelbergbahn summit, check out my article on things to do in Neuschwanstein. From the lower station of Tegelbergbahn there is an easy 2km path that goes to the bottom of the hill where the castle was built. On that same path mentionned in the photo stop 2, right in the middle, I decided to climb up the hill on the side. No track is indicated but I thought I might be able to photograph it from a different angle. Walking behind the castle there is an easy path going slightly up to the famous bridge called Marienbrucke. Take the time to turn around, admire the castle. From the Marienbrucke bridge Suspended above the ​Pollat gorge. It is a 10 to 15 min walk uphill from the castle entrance. This is the most famous shot of the castle. A classic but a very nice one! You will have to fight to get a spot to take your picture, but it is worth putting up with the crowds as you get unobstructed views of Neuschanstein from the side. Most people stop at the bridge and walk back to the castle. However there is a path that continues climbing where you can get away from the crowds. In Summer, there is a cruise running on the main lake Forggensee where I think you could also get some nice shots of the castle and the mountains. ​For more things to do around Neuschwantein, do not miss my dedicated post. Please, leave a comment if you want to share another spot! Love this place, some of my family are from near here so it will always have a special place in my heart! Thanks Masha. I spent 3 months in Munich and really enjoyed Bavaria. You should definitively go even if only for a weekend! Between Tegelbergbahn and the bottom of the castle hill, there is 2 kilometers so it depends on how fast you walk. The town is at the bottom of the castle’s hill. You need to plan time to get to the castle (by bus, carriage or on foot). There is often a queue to take the transports. From the castle to the Marienbrucke bridge is a 10 to 15 min walk if you do not stop, and 5 to 10 minutes more min to reach the other point further on the track. Do you have any thoughts/advice regarding this vantage point. Considering the angle (height and with the lake behind), 2 options I think: from a hot air balloon / paragliding or hiking between the Marienbrucke and the top of the Tegelbergbahn (a hike I sadly did not have time to do). Were you able to get the vantage point from the front of the castle? If so did you make the hike that Claire suggested? I will be going in June and would like to attempt myself and have not been able to find anything online regarding that amazing photo. Only Marienbrucke gives great side views of the castle. Sorry to hear it is closed for bridge. The other shots are all of the facades. Regarding on day in Munich I would recommend: a walk in the Englischer Garten, strolling the city center around Marienplatz to take in the architecture and the vibe of the city. And one of my favorite things, climb the tower of Saint Peter’s church for views of Munich from above and the mountains on a clear day. Thank you so much for posting this! 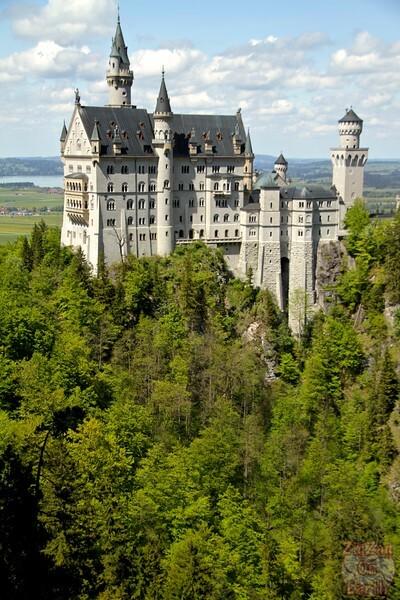 We are going in December and I have been researching where to get the best shots of the castle. What time of day did you go on the cable car to be with only 2 people? I’m guessing with 40 people in the car it wouldn’t be very easy to take a good photo. I am glad your are finding the article useful. The first thing I did in the morning was the cable car. And I stay only a little at the top. So when I came down, not many people were already leaving the summit. Amazing and interesting blog with amazing photos! I am really glad I have found your amazing blog about this lovely castle. This is one of my favorite castle. Thanks for sharing, if all goes well I’ll be able to put some of the info to work. When I tried in 2014, the tunnel from Austria was closed and I didn’t have time for an alternative route. Hi Daryl. I wish you a wonderful trip there. It is really a magnificent location! Please advise the best route to drive to see Black Forest in Germany. This post is the best thing I’ve seen on the castle so far. Is the cable car ride very steep? Also, where does the ride take you? Could you also tell me about the camera and lenses you used for these magnificent shots? We are planning a visit early next year. Thanks, I am glad you are finding it useful. The ride is steep but not the worst I have done.